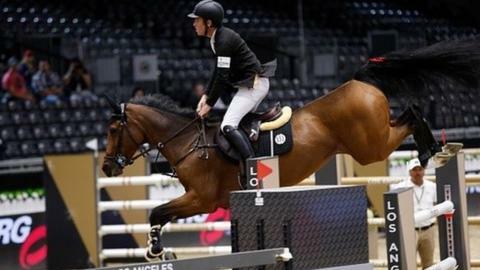 Luciana Diniz won the Global Champions Tour title with record-seeking British rider Scott Brash second, after he came eighth in the concluding Qatar leg. Brazil-born Portuguese Diniz claimed the Doha event to land the overall prize. World number one Brash, riding Hello Sanctos, was seeking to win the title for an unprecedented third time. But the 29-year-old Scot had to settle for the runners-up spot, with Swede Rolf-Goran Bengtsson third. "I had a silly fence in the first round, coming out of the double," said Brash. "I started the second round thinking that I had to be the fastest of the four-faulters to have any chance so I went as fast as I could and it's the reason I had a fence down. But Sanctos has been wonderful all year." In September, Brash became the first rider to win showjumping's grand slam, bagging the sport's biggest individual prize of 1m euros (£735,000). He claimed Grand Prix victories in Geneva, Aachen and Calgary.